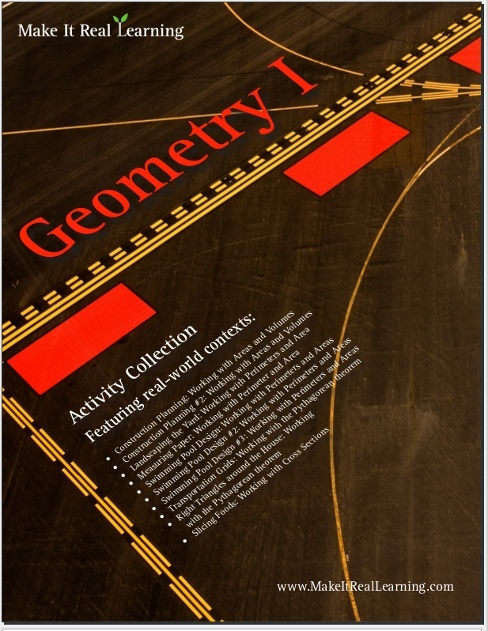 The Make It Real Learning Geometry 1 workbook focuses on real-world situations that may be effectively analyzed using common geometric concepts such as area, perimeter, volume, and Pythagorean Theorem. 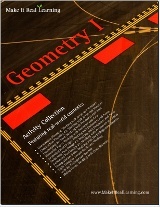 This book suits best grades 6-7. From calculating areas of swimming pools to cross-sections of common foods, learners get to use basic geometry in meaningful ways. Each activity integrates real world information, companies, and issues (e.g. Sahara Pools and Spas , Phoenix city map, ladders from Home Depot), not just "realistic" data. Working with Areas and Volumes Calculate area in square feet. Calculate volume in cubic feet. Convert cubic feet to cubic yards. Working with Perimeters and Areas Calculate irregular area composed of rectangles. Working with Perimeter and Area Calculate areas and perimeters of rectangles. Working with Cross Sections Draw the cross sections created by horizontal or vertical cuts of some common foods.